This well-designed 2 gallon water carry bag lets you transport water from a larger water supply to where you need it. Ideal for camping, hunting, home, work or emergencies, this water storage bag makes transporting water a snap. 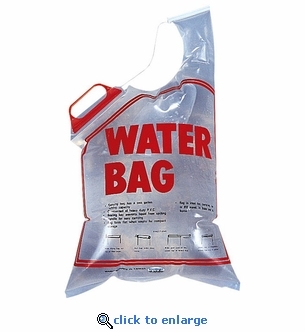 This easy to carry and easy to pour water bag folds flat for easy storage and makes a great addition to emergency kits. Ideal for transporting water in an emergencies. Made of heavy duty clear PVC. Carrying handle for portability and easy pouring. Sealing key closure prevents spilling.